Admission Price: Tickets £20/£10 using Sign up link to Eventbrite page. Students may attend for free, please use the link below, ID will be required. This concert takes place prior to engagements in the Festival de Wallonie in St-Hubert and Namur (Belgium) and the Utrecht Early Music Festival (Netherlands). The ensemble has been presented multiple times at the Metropolitan Museum of Art, the J. Paul Getty Center, and Stanford Live at Stanford University. UK engagements have included St Bartholomew-the-Great and St Paul’s Cathedral London. This programme explores the repertoires of Byzantine and Latin sacred music that coexisted on the island of Cyprus in the late Middle Ages. The Crusades brought to Cyprus French kings, whose imported musical traditions flourished alongside those of their Greek subjects. The vibrancy of their Mediterranean soundscape is captured in this programme, which traverses the diverse range of sacred music heard during the fifteenth century in Nicosia’s Orthodox and Catholic cathedrals: Greek and Latin hymns celebrating the divine patronage of St Hilarion of Gaza, lavish prayers for French royalty set to Ars Nova polyphony from the codex Torino J.II.9, and virtuosic Byzantine chants by Constantinopolitan and Cypriot composers. 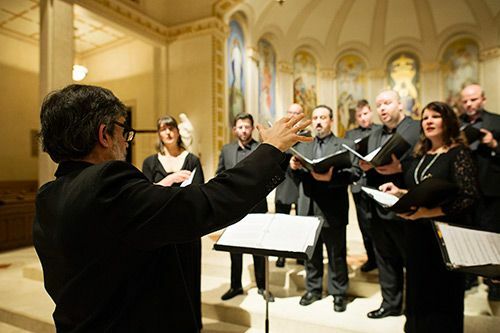 Its performances ‘like jewelled light flooding the space’ (Los Angeles Times), Cappella Romana is a vocal chamber ensemble based in Portland, Oregon (USA), and dedicated to combining passion with scholarship in its exploration of the musical traditions of the Christian East and West, with emphasis on early and contemporary music. Founded in 1991 by City University London Reader in Music Dr Alexander Lingas, Cappella Romana was named to refer to the mediaeval Greek concept of the Roman oikoumene (inhabited world), which embraced Rome and Western Europe, as well as the Byzantine Empire of Constantinople (“New Rome”) and its Slavic commonwealth. More information about Cappella Romana is available at www.cappellaromana.org. Students can attend the concert free of charge by booking through this special link. ID will be required on the door.